Tuesday April 3rd 1883 We got an early start at the washing this morning and were at it till two oclock the washing was so very large Rob and George Day went down to Davenport on the early train to hear the Amendment case argued before the Supreme Court. Mr Norris came came here to board today Rob is twenty nine years old today. 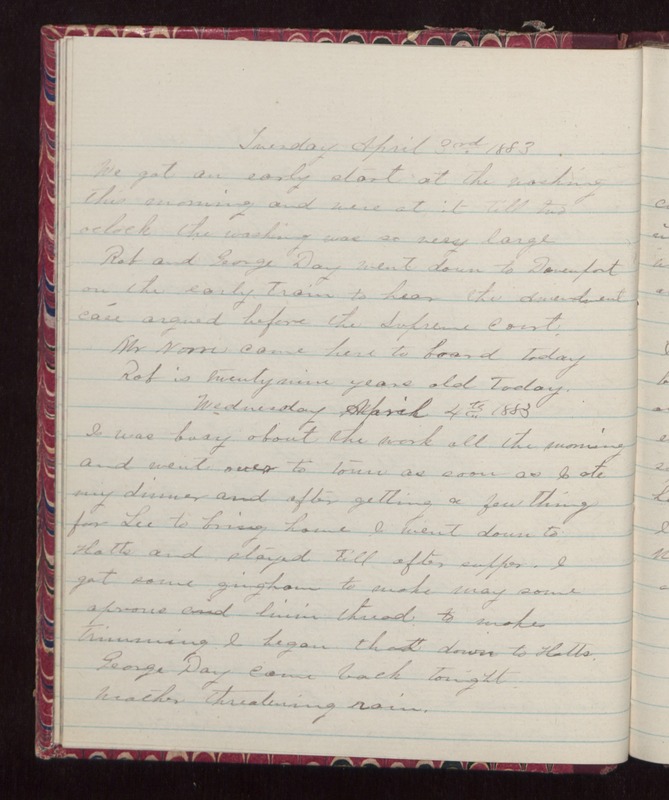 Wednesday April 4th 1883 I was busy about the work all the morning and went over to town as soon as I ate my dinner and after getting a few things for Lee to bring home I went down to Hatts and stayed till after supper. I got some gingham to make May some aprons and linin thread to make trimming I began that down to Hatts. George Day came back tonight. Weather threatening rain.